Currently all crime data released by the gardaí is considered to be ‘under reservation’, ie of insufficient quality, by the Central Statistics Office (CSO). GARDAÍ HAVE RELEASED drink driving statistics suggesting that 15,000 additional drink driving arrests have been carried out in the past 10 years compared to what was previously thought. An Garda Síochána released the numbers, split by Garda division, to Sinn Féin TD Peadar Tóibín following his submission of a parliamentary question (PQ) on the subject. The released numbers suggest that 127,967 drink driving arrests were carried out across all Garda divisions around the country between 2007 and the first four months of 2018. The data appears to contradict (and outnumber) that published by the Central Statistics Office (CSO) by just under 15,000 instances (14,875). A query to the gardaí as to the reason for the discrepancy had not been fully answered at the time of publication. A Garda spokesperson referred TheJournal.ie to the statistics published on the force’s own website. However these figures also fail to match either those provided to Tóibín or the CSO both. In the case of 2016 the figures are incomplete, with no entries for November or December of that year. The CSO has marked all of its crime statistics, which are delivered to the stats body via a data download from the gardaí’s own PULSE system, as being ‘under reservation’ (ie cannot be relied upon due to problems with ‘data quality’) as of March of this year, when it began to republish the statistics following a number of stoppages. Those stoppages stemmed from the revelation in June of last year that 89 homicides over 14 years had not been counted in official figures due to a ‘process issue’. However, drink driving statistics were not previously understood to be affected by erroneous data. Asked by TheJournal.ie what the difference might be between the CSO figures and what was released to Tóibín, a CSO spokesperson said that they ‘could not say’, and that the disparity ‘is a matter for the gardaí’. Tóibín’s request was originally delivered to the Department of Justice in May of 2017, and requested that the figures to be released be split by age and gender of those arrested. The final answer was delivered earlier in September, nearly 16 months after the initial request was lodged. It did not detail the figures split by age and gender as, in the words of Minister for Justice Charlie Flanagan in his reply, the data “is not readily available and… the collation of such data would require the expenditure of a disproportionate amount of Garda time”. The age and gender of a person arrested is routinely input on PULSE by the officers concerned. Why it is not currently collated in statistical form by An Garda Síochána is unclear, though a CSO spokesperson confirmed that such data is something the body is hoping to incorporate into its future releases. Without age and gender included, the data released by the gardaí should be routinely comparable with the data held by the CSO – however, this is not the case at present. The next release of national crime data by the CSO, covering the second quarter of 2018, is expected to happen on Monday 1 October. Drink driving will be made punishable by an automatic loss-of-licence once the current Road Traffic (Amendment) Act 2018, approved by the Dáil earlier this summer and signed into law by the President on 23 July, is commenced by the Minister for Transport Shane Ross. Previously, and for the moment, those breath-tested and found to have between 0.5mg and 0.8mg blood alcohol concentration are punished with penalty points, as opposed to a disqualification. The discrepancies seen in the released figures are split across the six Garda divisions (north, east, west, south, southeast, and Dublin) – with Dublin (3,589), the southeast (2,723), and the south (2,600) accounting for the majority of differences. The worst year for discrepancies was 2010 with 2,287 additional arrests detailed in the Garda statistics compared to those of the CSO. An additional 1,530 and 1,033 arrests are detailed for 2017 and the first four months of 2018 respectively. 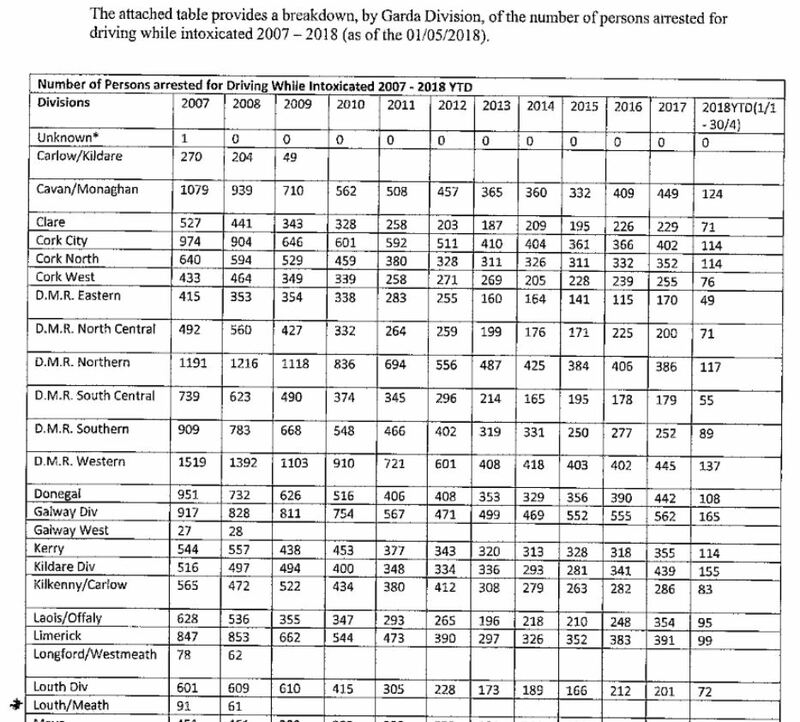 Previous investigations by TheJournal.ie into the issue of road traffic crime statistics revealed that people living close to Dublin are far more likely to have incurred penalty points compared to those living in rural areas, and that convictions for drink driving offences in Ireland have fallen to a massive extent over the past 10 years. 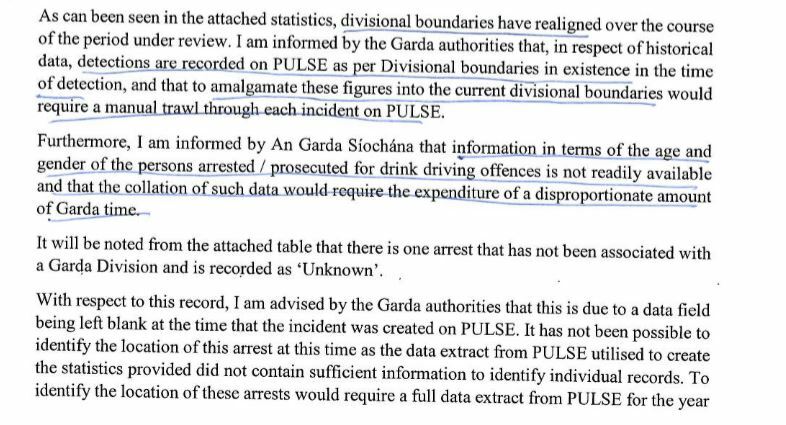 Email “Gardaí release number of drink driving arrests - 15,000 more than previously published”. Feedback on “Gardaí release number of drink driving arrests - 15,000 more than previously published”.